DFW’s premier gun range visited Mountain Vista luxury cabin in Broken Bow, OK and tell us we hit the bullseye with our location and amenities. “We’ve stayed in many cabins in Broken Bow over the years. This one ranks at the top,…beautiful views, comfy beds/linens, completely stocked kitchen and a BBQ grill that works great,” Eagle Gun Range owner Nanci Prince said. I’m so impressed with Eagle Gun Range, I recently became a customer and greatly enjoyed the experience. Communication with their staff was terrific and they went beyond the call of duty to get the exact firearm I wanted. “We truly overpacked because everything we needed was already there, including two coffee makers! We loved the hiking trails, fire pit and outdoor seating. The kids loved Netflix and the s’mores. Thanks for sharing your beautiful home…would love to return in the fall or sooner,” Nanci said. 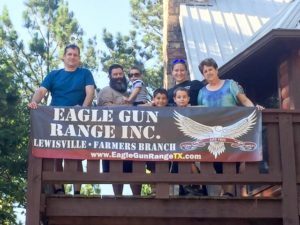 Many of our Beavers Bend guests are from the DFW metroplex and we hope you’ll visit Nanci and her staff at Eagle Gun Range soon. I highly recommend them and can vouch for their first-class service. Sherri and I are thrilled they enjoyed their experience in Beavers Bend. Whether you’re a seasoned firearms expert or beginner, they offer excellent training courses to improve your marksmanship. Eagle Gun Range can ship firearms to a Federal Firearms License dealer if you live out of state. Visit their beautiful Lewisville, TX facility at 491 Valley Ridge Boulevard. (972) 353-4867. 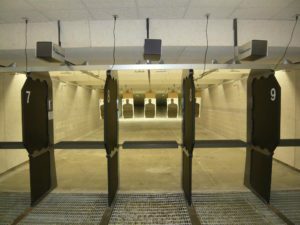 Virtual Tour of Eagle Gun Range. We hope you’ll aim for trips to Mountain Vista luxury cabin and Eagle Gun Range soon…both are sure shots!